CNET posted a Tech Culture article on new Doctor Who themed Pop character figures coming soon. The whole range of Pop cuties looks great – with figures for Rose, River Song, Captain Jack Harkness, Sarah Jane Smith, The Silence and the Ninth Doctor. 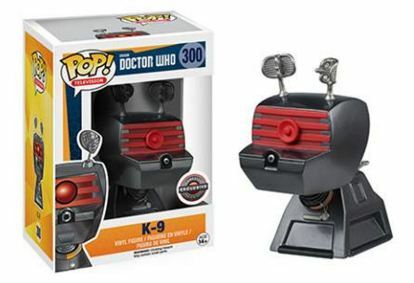 The steal of the collection, for me, has to be the K-9, which according to the C-NET blurb will be an exclusive (in the US at least) for GameStop. I hope that someone will have these available outside the US – whether international GameStops or otherwise – because I have money in hand right now to get one of these! Thumbs up to Bonnie Girl for posting this article and pictures. This entry was posted in Toys and tagged cnet, Doctor Who, funko, gamestop, pop figure, toys on January 13, 2016 by Paul B.